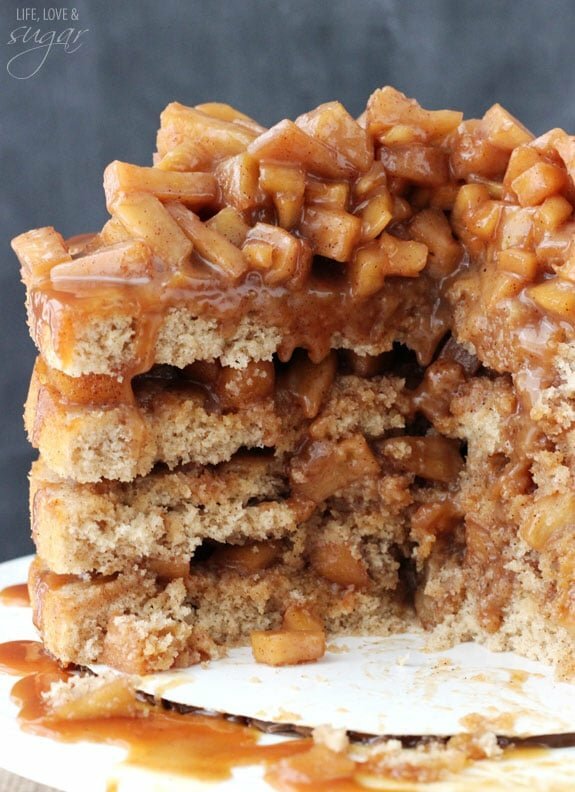 This Caramel Apple Layer Cake is made with layers of brown sugar cake soaked with caramel sauce and cinnamon apples. And without a need to ice the cake (it’s naked! ), it’s so easy to put together! It’s also amazingly good and my second recipe for Apple Week! 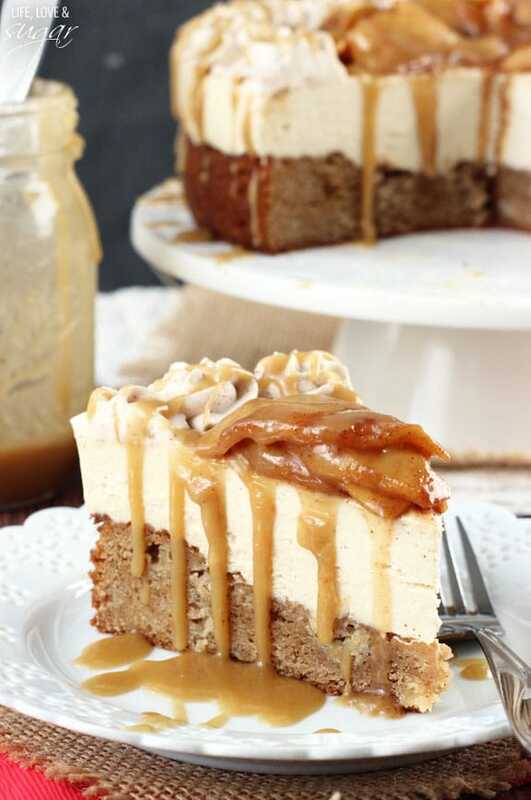 If you missed my first Apple Week recipe, check out my Caramel Apple Blondie Cheesecake here. And be sure to check out Julianne’s recipe for today too – Bourbon Apple Pie Ice Cream! This cake is based on this recipe for a Salted Caramel Cake. I made it a while ago and it was HUGE hit! I thought it’d be perfect with apples and I’ve been wanting to make this fun new version ever since. This cake looks complicated, but there’s actually just a number of steps involved. 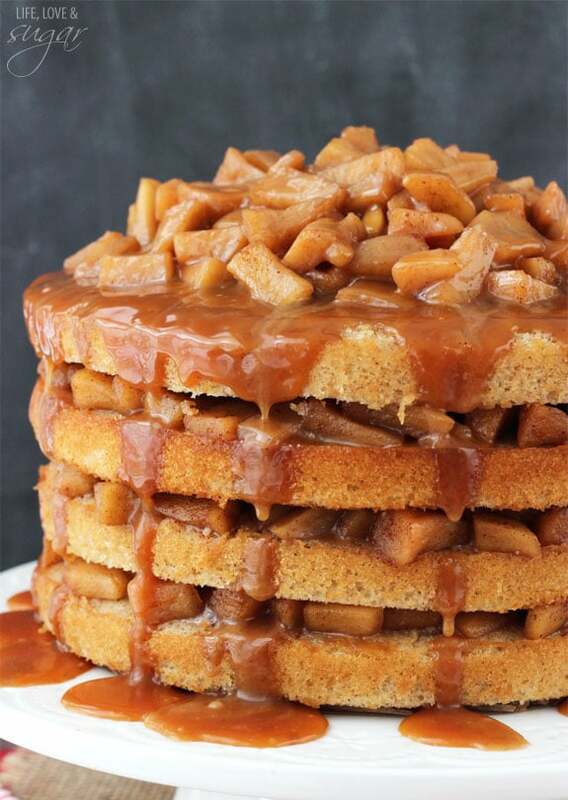 The main three phases are making the cake layers, the caramel sauce and the cinnamon apples. 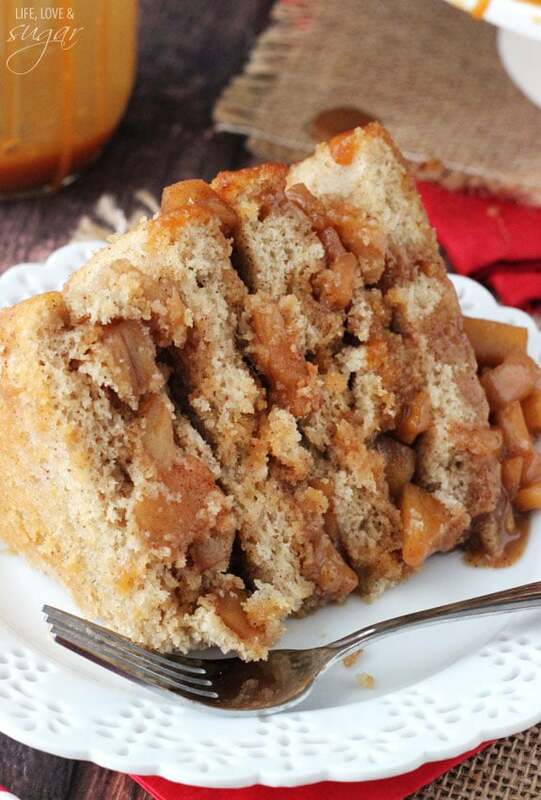 The cake layers are a tasty brown sugar cake with some apple pie spice mixed in. Pretty straight forward. The caramel sauce is a different one than the one I posted a couple weeks ago. That one was the easy version of caramel sauce. This version is a little more fussy, but works better in this cake. I’ve tried the cake both ways and prefer it this way. The caramel flavor is stronger. This caramel is made with granulated white sugar. The sugar cooks until it’s completely melted. It will clump, but eventually it will melt. Once it’s melted, you want to keep whisking while it comes to 350 degrees. It will happen quickly, so watch it closely. It burns very quickly and that does not smell good. Trust me. Once at temperature, you add the butter until melted, then the whipping cream. To make the cinnamon apples, mix the apples, sugar and spices and cook until they are at the softness you prefer. I prefer them to be a little crunchy, but still soft, so I recommend about 25-30 minutes. I also recommend chopping the apples, rather than slicing them. With a layered cake like this, it’s hard to cut through sliced apples when you are cutting slices of cake to eat. Chopped is the way to go. One of the great things about this layer cake is there’s no icing to worry about. No sides and edges to perfect. It’s all stacking, then leaving the cake naked. It’s a great look and perfect for this cake – it allows you to see the beautiful apples! 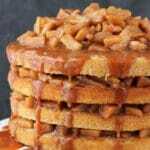 As the cakes are stacked, caramel is spread onto each one. It soaks into the layers and makes each one even more tasty and caramel flavored. You definitely don’t want to skip that step! 1. Line the bottoms of four 8 inch cake pans with parchment paper and grease the sides. Preheat oven to 350 degrees. 2. Cream together butter and sugars for about 2-3 minutes, until light and fluffy. 3. Add eggs one at a time and mix until incorporated. 4. Add vanilla, apple pie spice and cinnamon and mix until incorporated. 5. Alternate adding the flour and buttermilk, beginning and ending with flour, mixing until combined. 6. In another bowl, mix together baking soda and vinegar. Add mixture to batter and mix just until incorporated. 7. Spread batter evenly between the 4 pans and bake for 15-17 minutes. 8. Remove pans from oven when done and allow to cool for 2-3 minutes, then remove to cooling rack to finish cooling. 9. While the cakes cool, make the caramel. Add the sugar in an even layer to the bottom of a large saucepan. 10. Heat sugar on medium-high and whisk until the sugar has melted, about 5 minutes. The sugar will lump together, but eventually melt. 11. Continue whisking until the temperature reaches 350 degrees or the sugar has turned an amber color. It will reach 350 degrees very quickly after all the sugar has melted. Watch it very closely. It goes from nice caramel to burned very quickly. 12. Remove caramel from heat and add butter. Whisk until melted and combined. Mixture might bubble a bit. 13. Add the heavy cream and whisk until incorporated. 14. Cool caramel to room temperature. 15. When caramel and cakes are cool, cook apples. Combine apples, lemon, nutmeg, cinnamon and brown sugar in a medium pan and toss to coat. 16. Add butter and cook apples for about 25-30 minutes, stirring often, or until at preferred softness. 17. Remove from heat and allow to cool for about 30-40 minutes. I recommend putting the apples into another bowl to stop them from cooking more. 18. Once apples are cooled, it’s time to stack the cake. Place the first cake layer on your cake plate. 19. Spread about 4-5 tbsp of caramel sauce over the top of the cake layer and allow it to soak in. 20. Spread 1/4 of the apples in an even layer on top of the layer of cake. 21. Repeat steps 18-20 with the remaining layers of cake and apples. 22. Drizzle more caramel over the top of the cake. I need to learn how you get your caramel sauce to drip down perfectly. Like, it’s perfect. How do you do that?! And it looks so good taste-wise as well. More apple recipes! Yay! 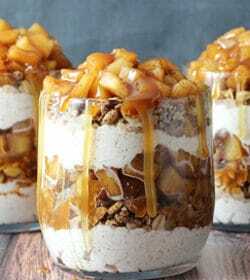 I just can’t get enough caramel and apples in my life right now so this is right up my alley!! Beautiful cake Lindsay! 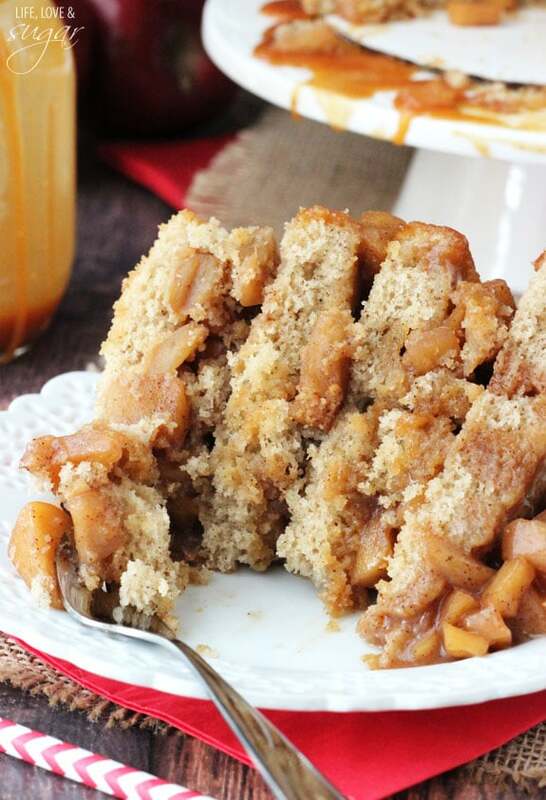 The brown sugar cake alone sounds great and then you doused with with caramel and apples! oh my GAWD!!! 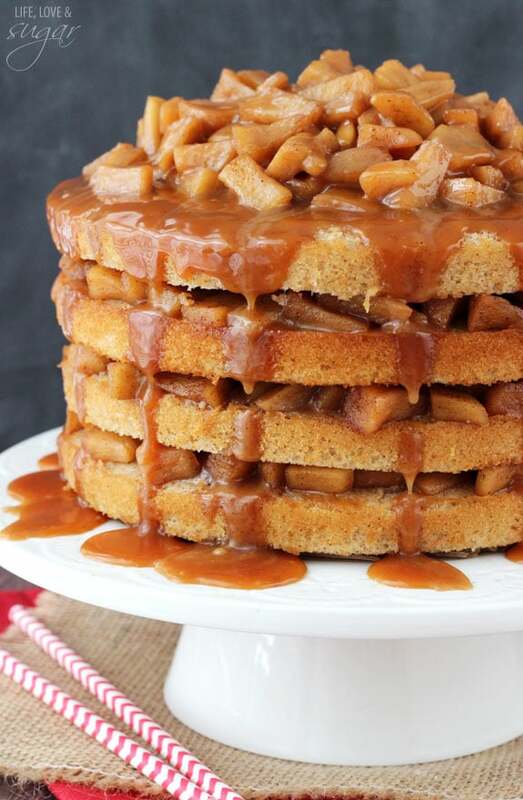 love this apple spice caramel apple layer cake!!! Amazing!! you are seriously the cake baking, cheesecake making. . dessert/sweet treats queen. Beautiful! Caramel soaked layers of cake?! Yes, please! As always you never cease to amaze me!!! This cake is insane!! Thanks Rachel! 🙂 Thanks for the pin! It never gets old to see drippy caramel on a delicious cake. I love all the layers with the apples peeking through. Looks amazing! Hi Lindsay, Is there any other alternative spice I can use if I cant get apple pie spice? Look gorgeous. I love naked cakes, since I’m not that much of a skilled decorated. Can’t wait to try this out! A naked cake never looked so delicious! Caramel gets me every time! I loooove this “naked cake” The dripping caramel OMG! You always make the most amazing cakes! This is beautiful! It’s like apple pie in a cake. And caramel soaked layers? You’re killing me with all this delicousness! There is nothing about this cake that I don’t just LOVE! Pinned! I am LOVING every thing about this cake Lindsay – pinned! 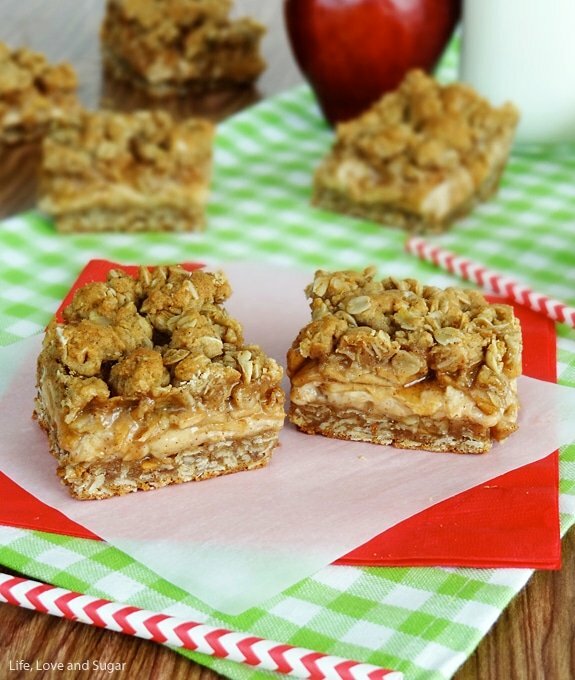 I’m loving all the apple recipes you’ve posted lately! The caramel soaked into each layer… Could this be more tempting? No frosting could ever top the deliciousness of those cinnamon apples. Absolute perfection! Man have I expressed my love for autumn accurately yet?! Because it’s all due to cakes like this and all this apple amazingness. The layers are gorgeous, Lindsay! Thanks so much Jess! I’m digging all the fall recipes from everyone too! Looks amazing! How much butter did you use for the apples? you didn’t mention it in the ingredients. I didn’t use butter, but you could add a tablespoon or two, if you like. Hi! I made this as a sheet cake the other night and it was AMAZING! But does it translate to cupcakes? I’m glad you enjoyed it! I haven’t ever tried it as cupcakes, but I’d think it’d be fine.